Maxi Climber Reviews - Is It Worth and Right for You? Getting in shape (and staying in shape) can be a huge undertaking, and one of the most important aspects of such an endeavor is exercise. But very few of us have the time or money needed for a gym membership or a personal trainer. Luckily, we live in an age when we can more or less bring the benefits of gym right into our own homes! Thanks to easy-to-use pieces of equipment like the Maxi Climber, we can now exercise at home without the stress of going to a gym or hiring a personal trainer. 1 What is Maxi Climber? 3 Who Could Use It? While there are a wide variety of at-home exercise machines, the Maxi Climber is known for it’s straightforward design and purpose; it is a vertical climber that helps you burn calories, trim fat, build up muscle mass, and improve your cardiovascular health. By using a Maxi Climber, you are putting yourself through a workout that most closely resembles rock-climbing; using the Maxi Climber basically involves using your upper body to lift your lower body, making it a work-out mostly based around your own body weight. The main benefit of the Maxi Climber is that it allows you to work many different muscles in your body at the same time; using the Maxi Climber can strengthen your core, biceps, triceps, and glutes. The second most important benefit of the Maxi Climber is its simplicity and ease of us. 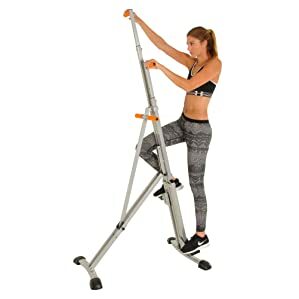 It is easy to both assemble after purchase and store away when not in use, and working out with the Maxi Climber is similarly straightforward. 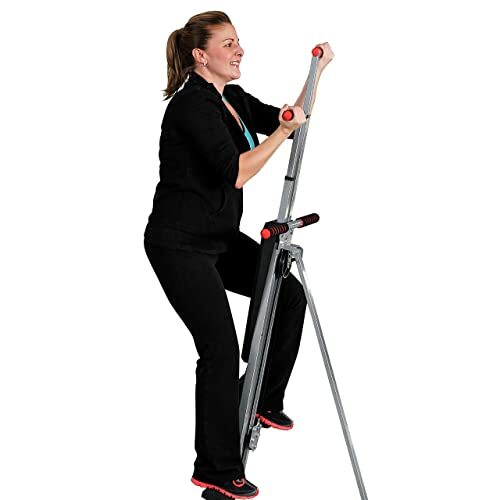 Additionally, the Maxi Climber allows you to do a full body workout without needing to switch between different types of equipment, and you will burn more calories on a Maxi Climber than on a simple treadmill or exercise bike. Also, the Maxi Climber is very quiet; this makes it a good choice if you like to watch TV while you workout, or if you want to exercise without disturbing your housemates or family members. One slight downside to the Maxi Climber is that you might have difficulty using it if you aren’t already in shape; if you aren’t accustomed to intense workouts, you may have difficulty using the Maxi Climber for longer periods of time. Also, while the Maxi Climber has five different height settings to allow for almost all people to use it, it cannot hold a person with a weight of over 240 pounds, so if you’re beyond that weight limit you will not be able to use the Maxi Climber safely. As previously mentioned, pretty much anyone who wants to get a full-body workout can purchase and use a Maxi Climber. That being said, there is a weight limitation of 240 pounds on the device. We’ve mentioned some of the benefits of the Maxi Climber, but let’s go a little more in-depth with those features (and some others), so you can better understand how a Maxi Climber functions and why it might be a good choice for your at-home workout. 1. Easy Set-up – The Maxi Climber is incredibly simple to assemble once you purchase it. Size-wise, it’s 24 inches wide and 36 inches long, and the adjustable height hits a maximum of 84 inches. 2. Easy Storage – The Maxi Climber folds up very easily and can be stored in a closet or somewhere similar with minimal fuss. 3. Durability – Made out of strong and sturdy cold-rolled steel, this exercise machine can withstand vigorous exercise much better than some similar products made of cheaper materials. 4. Helpful Features – The Maxi Climber features isometric hand-grips that provide a firm yet non-stick hold that helps provide you with stability during your workout. There is also a built-in timer that lets you keep track of how long or short your workout is. 5. Intense Full Body Workout – The Maxi Climber can help you increase muscle strength in multiple portions of your body, while also supporting cardiovascular health. 6. Price – There are other similar products currently on the market, but the Maxi Climber is more or less one of the cheapest options available if you want a simple but well-made product. It’s a good choice if you want something that will provide you with a powerful workout without breaking your budget. Due to the increasingly popularity of vertical climbers, there are now products besides the Maxi Climber available on the market. The second most sought after climber is the Versa Climber, a more expensive and high-end version of the Maxi Climber. There is also the Conquer Vertical Climber, a product that is very similar to the Maxi Climber, but slightly cheaper. The Versa Climber, while utilizing the same general concept as the Maxi Climber, takes it a step further by adding on several small but helpful features. The pedals on the Versa Climber have three different settings that can be adjusted for additional stability, Velcro straps to help keep your feet in place while working out, and a more in-depth interface that can allow you to monitor almost all aspects of your work out. In general, the Versa Climber is a more sophisticated version of the Maxi Climber with more features but also a much heftier price tag. The Conquer Climber, on the other hand, is more or less the opposite; it is cheaper than both the Versa and the Maxi, but also with a few of the drawbacks that such a low price might imply. While the Conquer Climber functions basically the same as the Maxi Climber, it is reported to be not as durable as its counterpart; some customers have even reported the metal frames of their Conquer Climbers falling apart mid-workout if you exercise too intensely. Also, while the Conquer Climber folds up like the Maxi Climber, it is heavier and bulkier than its counterpart, making it more difficult to store away neatly. That being said, it has also been reported that the Conquer does provide a good workout if used carefully, and it does have a lower price than both the Maxi Climber and the Versa Climber. In essence, the Conquer is a cheaper (and less safe) version of the Maxi Climber, and the Versa is a more expensive one with additional features. The Maxi Climber remains, in our opinion, the best choice out of the three, if you want a machine that is the best value for the price. The most important factor to be aware of with the Maxi Climber is the sheer intensity of any given workout. Due to the full-body nature of exercising on a Maxi Climber, you will likely need to start with shorter workouts to increase your stamina before extending your workout time. As previously mentioned, the Maxi Climber functions by mimicking the motions of rock-climbing, bringing your right leg and arm up and down in tandem and doing the same for your left side as well. This helps build strength in not just your upper body but in your gluteal muscles as well, with the additional bonus of increasing your overall cardiovascular health. 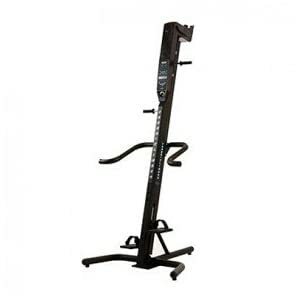 Customers who have purchased Maxi Climbers report that their workouts on this machine are simple yet satisfying, providing a powerful and effective workout that helps them burn calories and get in shape. Overall, the Maxi Climber is a very good choice if you want a vertical climber that comes reasonably priced when compared to alternative products and will provide you with an intense workout at home. As always, only you can decide in the end if the Maxi Climber would be right for you and your household, but we hope that the information we’ve provided for you in this article helps in that decision-making process. Thanks for sharing such an informative article. Special thanks for attaching a beautiful video. I heard that Maxi climber helps to strength the muscle. Is it true?